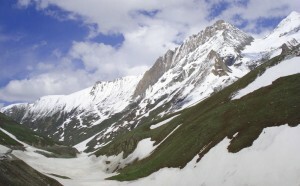 Drass, ‘The Gateway of Ladhak’, is situated 60 km west of Kargil on the road to Srinagar at an altitude of 3230mts. It has become famous as the second coldest inhabited place in the world by virtue of the intense cold that descends upon the valley along with repeated snowfall during winter. Winter temperature is sometimes known to plummet to less than – 40° C. During the spring and summer valley around the township becomes very picturesque as the gentle undulating hillsides turn into lush green pastures splashed with a variety of fragment with flowers. Drass is a convenient for a three daylong trek to the Suru Valley across the sub-range separating the two valleys. The trek passes through some of the most beautiful upland villages and flowers sprinkled meadows on both side of the 4,500 mts. high Umbala pass, which falls enroute. Drass also offers numerous shorter trek and hikes to the upland villages. Buses plying between Srinagar and Kargil / Leh touch Drass. Local buses leave Kargil in the morning and afternoon for Drass. This entry was posted in Drass, Jammu & Kashmir and tagged The Gateway of Ladhak. Bookmark the permalink.